Scala IDE 4.2-RC1 is out! 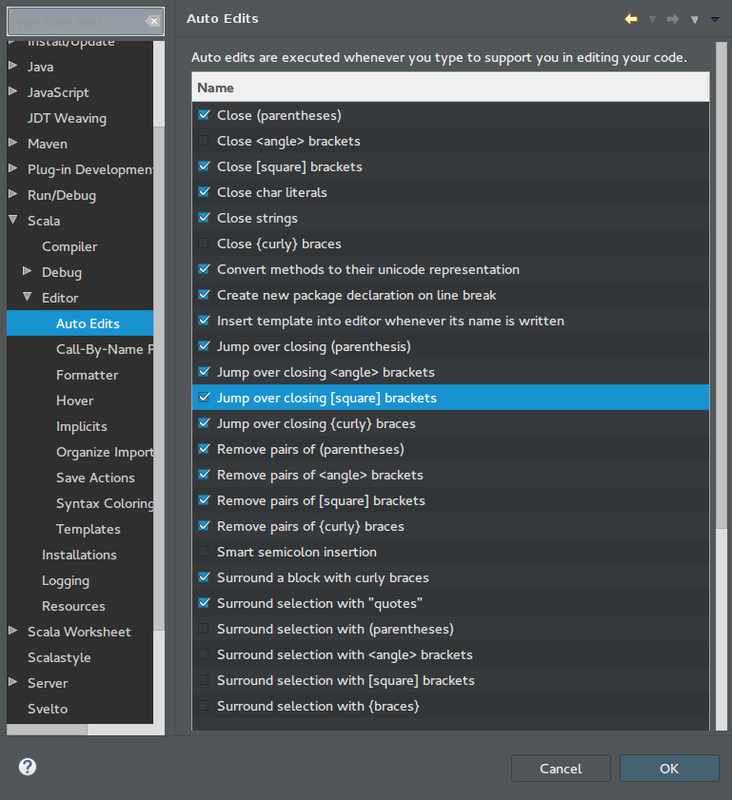 We are happy to announce a new Scala IDE release that contains beside of some bug fixes, especially around refactoring support, also new features like the Async debugger and Auto Edits. Normally we would say that this release candidate will become the final version if no blockers are found during the next week. Since there are huge new features introduced we extend this time period in order to ensure that enough people have the chance to try it before the stable release is announced. You should especially checkout the Auto Edits “Insert template into editor whenever its name is written” and “Surround a block with curly braces”. These ones are among the new ones and may be able to improve your live a bit. Check out there description at the bottom of the page (not shown in the above screenshot). The Async Debugger is an improvement to the Scala Debugger. It enables control flow tracking in your cutting edge reactive applications. It is the must for every developer who needs to trace control flow in existing and newly built applications where Scala Future or Akka Actors are playing a key role. This debugger improvement allows you to stop at breakpoints and find the trigger of the suspicious event when it was sent from a different thread. For the beginning there is the “Async Stack View” introduced. It allows you to jump to the sender of a message in an actor system and to find out about the context where a Future is started. You can see the debugger in action in this talk by Iulian Dragos. A new major version of Scala is coming and Scala IDE should of course be able to handle it well. If you want to check out the latest 2.12.0-M1 you can do so. The only thing you have to do in order to make Scala IDE happy is to add it as a Scala installation to your workspace. Read this article if you don’t know how to add such a Scala installation. For the full list of changes, see the changelog.